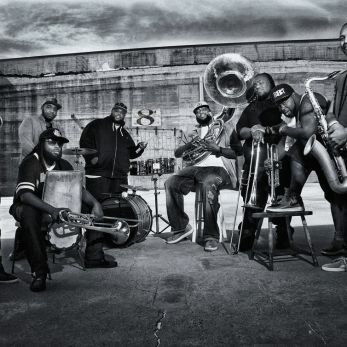 Hot 8 Brass Band return to the UK from their hometown of New Orleans for a European Tour. Their newly released cover version of Joy Division’s Love Will Tear Us Apart adds to their phenomenal catalogue of original music, New Orleans classics and their choice cover versions. Having released music on Brighton’s own Tru Thoughts Records for the last decade, and performing for them at their 18th Birthday Parties at the Brighton Dome and Roundhouse, London (along with performing under request from Kate Tempest at a sell out show at the Brighton Dome for the Brighton Festival 2017), we are pleased to get the Hot 8 down to the Concorde for this tour to celebrate their Take Cover release (coming early 2019). Check out their classic version of Marvin Gaye’s Sexual Healing, as performed and recorded in Brighton’s North Laines.